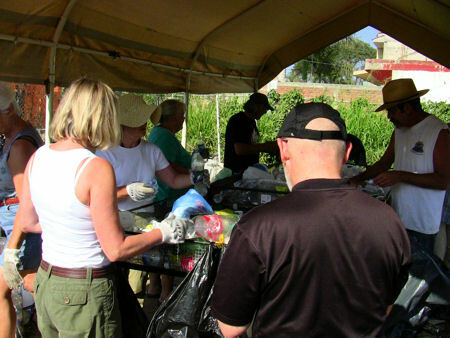 Recyclers of Bucerias is a not for profit program run totally by volunteers. All of the money generated from recycling is used to improve the lives of the citizens of Bucerias. The focus is to inform the community about recycling while collecting plastic bottles and aluminum cans. They have purchased large wire baskets and placed them throughout the neighborhoods of Bucerias to collect the recylables and they are educating the community about recycling. They are always looking for volunteers, either bi-lingual or with some Spanish/English with language skills to help in passing out information and to gather information. Also looking for dedicated, regular volunteers who can spend a few hours on Thursday morning helping with the recycling program. Sorting, loading and helping with pick-ups would be appreciated. Wear your work clothes! Just 2 or 3 hours will really help us out a lot. Early every Thursday morning volunteers drive through Bucerias and collect recycling from homes and businesses. 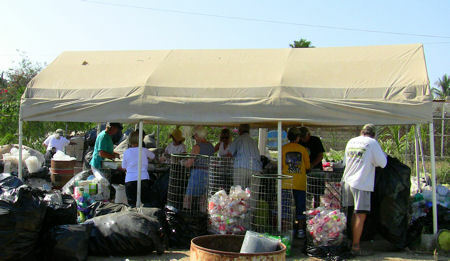 It’s all taken to a sorting and storage lot where volunteers sort and bag materials for transport to the recycling center. The efforts of all involved have really been making a difference to our area. Almost 10 tons of material have been collected and donated over $7,000 pesos back into the community! Location is at the corner of C. Encino and C. Invierno.